Goalie David LeNeveu, who is in the Stanley Cup Final as the Rangers backup, beginning one of the drills designed to challenge and train his ability to read the puck and play, something that is so important in the pro game today. 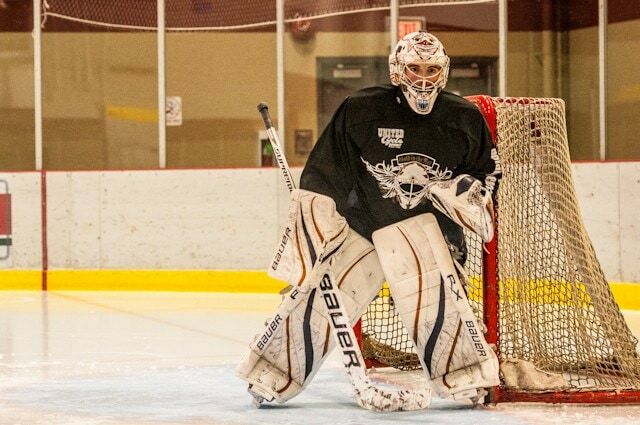 The last time InGoal Magazine saw David LeNeveu was on Vancouver Island last summer, as he took to the ice for training sessions with his long-time personal goaltending coach, Perry Elderbroom of Gold in the Net goaltending schools. LeNeveu, a 10-year pro with NHL experience in Phoenix and Columbus, in was coming off his first season in Austria and still looking for a contract for the 2013-14 season. Fast forward to the start of the Stanley Cup Final and there was LeNeveu on the ice taking turns with Henrik Lundqvist in the New York Rangers net during Game 1 warm ups after regular backup Cam Talbot was injured in practice. 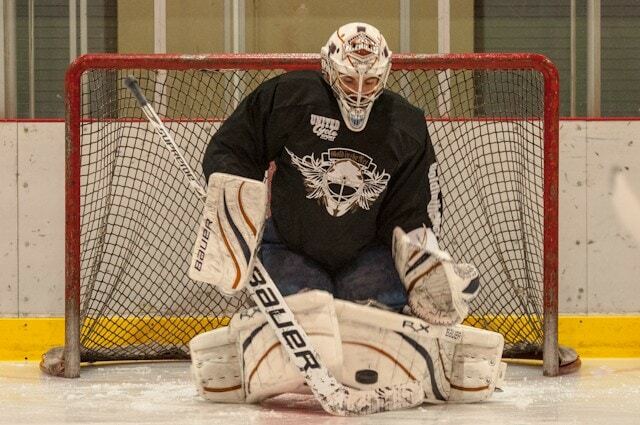 LeNeveu and Elderbroom were kind enough to team up with InGoal in the past to share one of the goalie’s favourite drills, one designed to add more of a “game-like” situation and force the goalie to make a read on the puck, something missing from a lot of summer sessions. 1. Use tarps or cut-up sheets to hang over the net to reduce visibility and complete blindspots. 2. You can elevate the nets off the ice with extra pucks or 2×4’s. This allows the shooters to pass or shoot “through” the screens.